When the rumours of a potential Gary Bowyer resignation began to surface at around 5pm on Monday afternoon, it didn’t really register. After all, there were the same whispers last week before the season opener at Wycombe and nothing came of it. Indeed, talk of a frustrated Blackpool manager hardly counts as news at all with every manager the Oystons have ever employed being rumoured to be on the brink of walking out at one time or another. However, the reports were swiftly confirmed by both the Mail and the Gazette less than an hour later and the crisis surrounding the club further deepened. At the time of writing, the reason for Bowyer’s decision to walk just one game into the campaign is unclear. That’s not to say we can’t have a damn good guess though. It’s obviously a challenging role at the best of times, but with the transfer window mere days away and a squad that on paper looks weaker than the one he had in May, the logical instinct is to assume a lack of support in recruitment is the root cause. 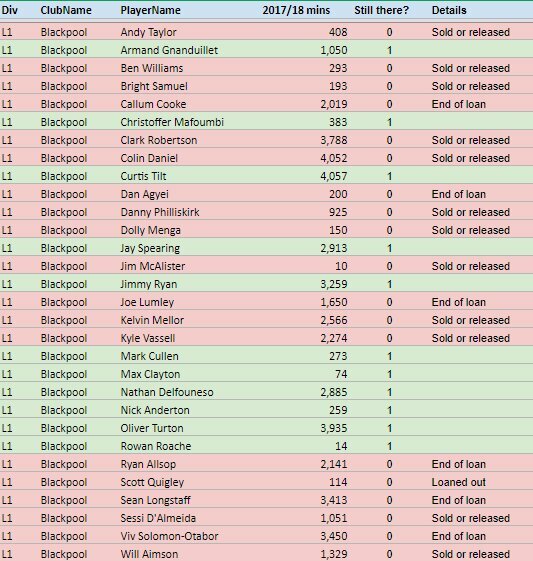 Between contracts expiring and loan players returning to their parent clubs, the Seasiders lost a huge number of key men from last season. Only three clubs – Bradford, Peterborough and Cheltenham – in the 92 lost more minutes from their squad over the summer break and the below graphic shows the scale of the exodus Bowyer had to deal with. To make matters even worse, one name on that list who does remain at the club is Curtis Tilt, who has been heavily linked with a move to Ipswich Town. The former Wrexham man featured for more minutes than any other player last time out, so if he were to depart as well it would leave the team even further depleted. That Bowyer deemed it appropriate to leave Tilt out of the last pre-season friendly and the 0-0 league draw at Wycombe is a sign that a move is likely, even if Ipswich may have turned their attention elsewhere. Bowyer was able to bring new faces in with 12 players coming through the door, but whether they are true replacements is hard to justify. Four loans, six free transfers and two signings from non-league has not inspired too much confidence, even if some of those could turn out to be shrewd acquisitions. The now-departed boss made no secret of his desire to strengthen the squad, but his sudden resignation this evening would suggest that the hoped-for arrivals were not going to materialise. A lack of support in the transfer market is likely the straw that broke the camel’s back, but it is hard to believe it is the only reason. The recent story that Bowyer had had to dip into his own pockets to pay for temporary training pitches in the Preston area is yet another farcical example of the challenges managers at normal clubs are unlikely to face. Squires Gate of course remains a mess, despite promises in 2009, 2012, 2015 and numerous times in between that the club would be either leaving or completely revamping its’ “hellhole” facilities. Throw in the chaos and uncertainty surrounding the general ownership of the club and it’s astounding Bowyer has lasted over two years. What to make of Bowyer, then? On an objective level, it’s hard to argue with the former Blackburn man’s record while at Bloomfield Road. In his first season he managed to arrest the freefall of back-to-back relegations and win an instant promotion back to League One via the play-offs, however unconvincing it may have looked at times. He then managed to keep the club there on what was probably a modest budget, with the streaks of good form outweighing the slumps to guide ‘Pool to a comfortable-looking 12th position. In any normal circumstances, you’d have to recognise it as a job well done and expect that board and manager would look to kick on again and aim for a promotion or play-off push. This is clearly not a normal club with normal circumstances, mind. Bowyer’s squad has been gutted and he has been asked to start almost from scratch with what appears to be a reduced budget. A thankless task if ever there was one. Who can blame him for walking? This is where some nuance comes into play, however. Blame him for walking? Not a chance. Have great sympathy for him? Welllllll…. Nobody can claim that Bowyer didn’t know what he was getting himself into. His own experience at Blackburn alone should have taught him what managing at a crisis club can entail, and Rovers’ problems almost pale into insignificance compared to what awaited him at Bloomfield Road. Bowyer was at Ewood Park when Michael Appleton arrived as manager and in fact succeeded Appleton, who had joined the East Lancashire club after just nine weeks on the Fylde coast. Appleton had few good words about his time working for the Oyston family. Nor did Barry Ferguson. Or Jose Riga. Or even Lee ****ing Clark for that matter. Anyone in football should know what Blackpool are like by this point, there are no secrets anymore. And yet (and yet!) Bowyer still took the job. And perhaps that’s the key word in all of this: job. Gary Bowyer was just getting on with his job, and I’m sure he would say a bloody good job it was too. It would be difficult to say otherwise given his achievements amidst the chaos engulfing the club. Yet we shouldn’t have to feel sorry for him. His stock will have risen, he will get the appropriate kudos for handling a sticky situation with calm and dignity and he will earn himself a job elsewhere, which he is likely to find much less stressful. Ah, the key question. It’s the million dollar question and in truth only two people really know or can control what comes next. The bigger picture looks to be at a stalemate with Owen Oyston yet to clear the balance of his £31.2m judgement awarded to Valeri Belokon, and the Latvian seemingly not in a great rush to bring things to a speedy resolution, although the perceived “control” Belokon has is perhaps overplayed with the legal system moving more slowly than few of us ever realised when the high court made their ruling in November 2017. The power that we as fans have remains in sticking to our boycott principles. A loss-making business can only be sustained for so long, Latvian intervention or no Latvian intervention. In the short-term and what amounts to being more and more of an irrelevant sideshow, the football side of the club looks to be in the hands of Bowyer’s assistant Terry McPhillips. The mealy-mouthed club statement hopes that Bowyer’s “legacy and wonderful team spirit that [he has] engendered will endure through [his] protégé”. That will be the 49 year old protege of 47 year old Gary Bowyer, who he has worked with for less than a year. You’ve got to laugh really. Good luck to McPhillips, because he’s certainly going to need it. Just like his numerous predecessors he will have his work cut out for him and you have to question the wisdom of taking it on at all. Then again, a job’s a job and it’s an opportunity he probably can’t afford to pass up, whether he gets it full-time or not. We just have to hope that he will be one of the last, if not the last, unfortunate soul to have to attempt to make a silk purse of a sow’s ear.